In 1931, the gangster movie came of age with Warner Brothers' The Public Enemy. Alongside Little Caesar and, the following year, Scarface, it made the pulpy tommy-gun melodramas into something, as Reel Journal said in the May '31 issue, "absolutely serious from start to finish" and "meant to be taken seriously by the audience." The New York Times noted Warners' "laudable motive" of "apprising the audience that the hoodlums and terrorists of the underworld must be exposed and the glamour ripped from them," and the film's moral that "civilization is on her knees and inquiring loudly as to what is to be done." It's easy to forget that the first audiences who made The Public Enemy a hit watched it aware of the fresh-ink headlines that inspired its machine-gun fire and gangland warfare and Prohibition beer-smuggling. During the '20s Al Capone and others like him had been made into celebrities. Their bios were often built up as Horatio Alger success stories of poor immigrants rising to the top of American Dream capitalist ideals, and audiences envied their lives of freedom and excitement. But times were changing, with restrictive moralism on the march. So Warner Brothers (ostensibly, at least) imbued the gangster genre with a social conscience, and sold The Public Enemy as a cautionary tale that pointedly did not glorify crooks and murderers. Darryl F. Zanuck, the studio's head of production, urged the sourpusses at the Hays Office to see in it a message that "only by the betterment of environment and education for the masses can we overcome the widespread tendency toward lawbreaking." Whether Zanuck was sincere or just trying an end-run around small-town censor boards, Reel Journal ended its review by asserting that there "is a lesson and daring truth in the picture, and we believe it was meant to awaken honest citizens to the gangster tyranny prevalent in large cities today." But of course no one went to a gangster movie to be awakened, not like that anyway. Instead, in The Public Enemy they got relative newcomer Jimmy Cagney starring in the lead role, which guaranteed that volatile mobster Tom Powers was the most attractive and captivating force on the screen. This is, in fact, the breakthrough movie that made a star out of Cagney, who hereafter embodied the image of gangster cool for generations. Its success proved, if by then there was any doubt, that audiences will go for a charismatic lowlife over a dull hero any day of the week, a lesson Hollywood never forgot. Watching The Public Enemy unfold from beginning to end is almost like experiencing a compressed metaphor for gangster pictures up to that point. Director William A. Wellman starts us off thinking we're getting a quaint and familiar melodrama, but by the end he's hooked us into something else altogether  something shocking and extraordinary, especially to 1931 audiences. The opening credits appear over images of the film's dramatis personae, who acknowledge us in a manner that even in '31 must have seemed as old-fashioned as its theme music, the lightweight ditty "I'm Forever Blowing Bubbles." From there we follow a mean little boy, Tom Powers, and his sidekick Matt in Chicago's skid row South Side. At first, their youthful ruffianism seems no more foreboding than the average Little Rascals shenanigans. But Tom's brutish father and passive mother can't compare to the thrills of petty theft and a gang of two-bit, saloon-dwelling crooks headed by the Fagin-like Putty Nose (Murray Kinnell). 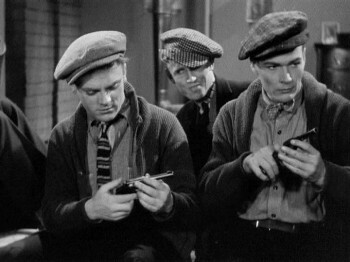 As the years pass through World War I and into Prohibition, the adult Tom (Cagney) and Matt (Edward Woods) graduate to larger thievery, their first .38s (a "Christmas present" from Putty Nose), and finally into Chicago's big leagues: the liquor racket, with Tom excelling as an enforcer for bootlegger Paddy Ryan (Robert Emmett O'Connor). The wages of sin are obvious: loads of dough, flashy cars, tailored suits, and beautiful, willing women. 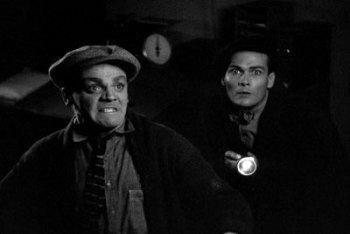 The climax arrives with a machine-gun ambush, and the close-ups of Cagney at night in the rain, with maddened bloodlust on his face, signal that this is not the movie we started with. The finale coldcocks us with its own horrific shocker, one that must have reminded contemporary movie-goers of Boris Karloff's doorway entrance in Frankenstein, playing up the street. The equation between gangster and monster was complete and indelible. When in the fade-out "I'm Forever Blowing Bubbles" reprises on a phonograph, the record runs out and we know it'll never be played again. The Public Enemy has acquired, predictably, a yesteryear patina. Nonetheless, it has repelled rust admirably. Chockablock with its dated elements are scenes that can still impress us with their modernity, such as the use of sound with a coal truck to set up the climactic ambush. The film's source-music and audio tricks, like "Wild Bill" Wellman's camerawork and editing, are striking for such an early sound-era Hollywood film. Cagney's Tom Powers gives The Public Enemy its dynamism and charisma. No one else onscreen can hold a candle to him. Originally, Cagney and Woods were cast with their parts here reversed, but the studio flipped the casting just before shooting began after catching sight of Cagney in action in another film. Cagney's body language and his ease with street-level speech  a holdover from his own youth on the streets of New York City  were a revelation. 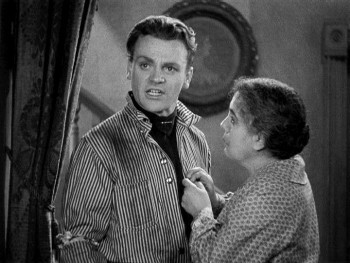 Tom was no cartoonish caricature of a thug, and the reviews of the day praised Cagney's naturalism as part of the film's realism. In the documentary featurette on this disc, Martin Scorsese says that before he shot The Aviator he showed his cast The Public Enemy, and when Cagney's entrance arrived someone exclaimed "Modern screen acting begins." In comparison, Woods displays little flair, and Beryl Mercer makes Tom's schmaltzy mother so fluttery and cloying that she comes across as soft-headed as well as -hearted. The "girls" are fine, with the clanging exception of Harlow, whose line-readings sound so leaden and amateurish that not even Cagney can save her. Neither Tom's fate nor the film's text prologue/epilogue, disclaimers extolling its wholesome social intentions, budged the delicate bluenose pressure groups such as the Daughters of the American Revolution and the League of Decency. 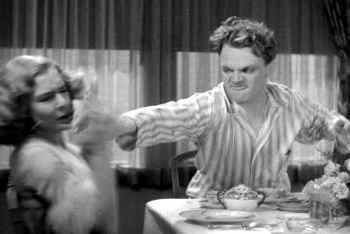 The Public Enemy's violent realism, scenes blatant in their sexual suggestiveness, and (I have no doubt) the magnetism of Cagney's performance helped ring in Hollywood's self-censoring Production Code of 1934, which sanitized criminal and sexual subject matter for years. In '38 Cagney played one of his best-remembered tough guys in a movie that sandwiched gangster drama, social environmentalism, and the Production Code's notion of values, Angels With Dirty Faces. In '49, with the Code's stranglehold loosening up, Cagney's Cody Jarret in White Heat was, in essence, Tom Powers magnified into a brutal psychopath. Part of the six-disc Warner Gangsters Collection, The Public Enemy arrives on DVD from a honey of a print. The black-and-white tones are sharp and solid, and only a few scenes appear to be sourced from masters that show noticeable wear. The rainy night shots near the end are fabulous. The DD 1.0 monaural audio is also first-rate. A 1949 reissue trimmed nine minutes of footage by removing, among other things, the real-life character Bugs Moran. That lost footage has not been restored, though the deletions are seamless. The extras start with a thorough, pleasurable commentary by author Robert Sklar, who annotates the film with ample background and production info, bios of the stars, and its context both as a gangster film and as a reflection of the Prohibition era. Here's where we find out that the actress original picked for Harlow's role was (sigh) Louise Brooks, a fact that now has us gnashing our teeth that much harder every time we sit through Harlow's grating performance. Sklar also tells us about the sexually charged scenes the Hays Office censored, and gives the straight dope on that grapefruit facial, squashing a Hollywood myth in the process. Chipper Leonard Maltin hosts Warner Night at the Movies 1931, which brings back that old-time movie-going experience (BYOB, of course). It starts with the trailer for another  and very different  1931 Cagney film, Blonde Crazy, a guys-and-dolls hotel romance with Joan Blondell. A clip from a "Hearst Metrotone News" reel (1½ mins.) stages women athletes training for the 1932 Olympiad. (We've come a long way, baby.) The short is The Eyes Have It (10 mins. ), an early Edgar Bergen and Charlie McCarthy opus. The cartoon is a real golden oldie, Friz Freleng's all-singing Merry Melodies "Smile, Darn Ya, Smile!" (remember the song from Roger Rabbit? ), starring Foxy, the Warners' short-lived response to Mickey Mouse. Martin Scorsese kicks off the 2005 featurette Beer and Blood: Enemies of the Public (19 mins.) by recounting the impact it and Little Caesar had on him as a kid. He appears with Robert Sklar, Alain Silver, Dr. Drew Casper, and writer Mark Viera in a fine primer on The Public Enemy. This being Cagney's breakthrough film, the newly discovered star receives special attention for his style and unmissable screen impact. Harlow is excused for her "presence," and director "Wild Bill" Wellman is profiled. Rounding out the extras are the text crawl that preceded the film's 1954 re-release with Little Caesar (41 secs.). Finally there's The Public Enemy's original theatrical promo, which must have been crafted before footage became available, as it uses not clips from the film but almost childlike cartoon animations of guns blasting, a thug in a doorway, and tag lines exploding like fireworks.